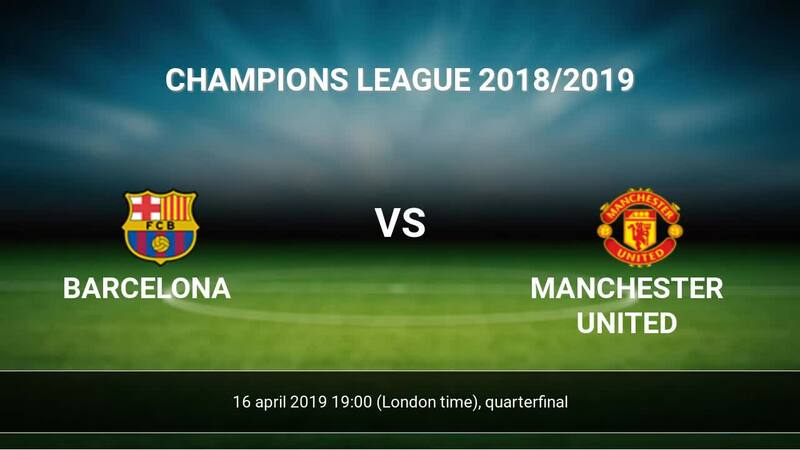 Barcelona meet in the quarter-finals of the Champions League Manchester United at the Camp Nou Stadium on 16-04-2019. The Barcelona team made an important and difficult victory at Manchester United for a single goal, in the framework of the quarter-finals of the Champions League, at the meeting at Old Trafford. As everyone expected, the Catalan team imposed their dominance on the start of the match, with their skill starring Lionel Messi, but the threat came from another star, Uruguayan Luis Suarez, who scored with the help of defender Luke Shaw, Who broke the opinion of the rule of the flag, after the latter to indicate a case of infiltration, to give his team the goal of the lead at the thirteenth minute. Barcelona won 4 direct matches. Manchester United won 3 matches. 2 matches ended in a draw. On average in direct matches both teams scored a 1.78 goals per Match. Barcelona in actual season average scored 2.32 goals per match. In 26 (89.66%) matches played at home was total goals (team and opponent) Over 1.5 goals. In 18 (62.07%) matches in season 2019 played at home was total goals (team and opponent) Over 2.5 goals. Manchester United average scored 1.66 goals per match in season 2019. In 24 (85.71%) matches played away was total goals (team and opponent) Over 1.5 goals. In 18 (64.29%) matches played away team was total goals (team and opponent) Over 2.5 goals.